"Resistor is a passive electrical component with the primary function to limit the flow of electric current"
A resistor is an electrical component that limits or regulates the flow of electrical current in an electronic circuit. Many SMD resistors do not have any markings on them to indicate their value. For these devices, once they are loose and out of their packaging it is very difficult to tell their value. Accordingly SMD resistors are typically used within reels or other packages where there is no chance of different values being mixed. A three figure SMT resistor coding system is the one that is normally used for standard tolerance resistors. As the name indicates this SMD resistor marking system uses three figures. The first two figures in the code indicate the significant figures, and the third is a multiplier. This is the same as the coloured rings used for wired resistors, except that actual numbers are used instead of colours. Therefore an SMD resistor with the figures 472 would have a resistance of 47 x 102 ohms, or 4.7kΩ. However beware of resistors marked with figures such as 100. This is not 100 ohms, but it follows the scheme exactly and it is 10 x 100 or 10 x 1 = 10 Ω. Where resistance values less than ten ohms are used, the letter "R" is used to indicate the position of the decimal point. As an example, a resistor with the value 4R7 would be 4.7Ω. The four digit or four figure SMT resistor marking scheme is used for marking high tolerance SMD resistors. Its format is very similar to the three figure SMT resistor making scheme, but expanded to give the higher number of significant figures needed for higher tolerance resistors. In this coding scheme, the first three numbers will indicate the significant digits, and the fourth is the multiplier. 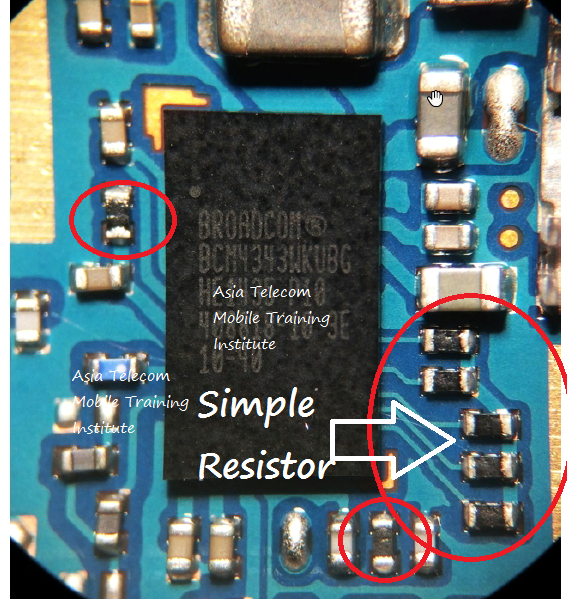 Therefore an SMD resistor with the figures 4702 would have a resistance of 470 x 102 ohms, or 47kΩ. Resistors with values of less than 100 ohms are marked utilise the letter 'R', as before, to indicate the position of the decimal point. A further surface mount resistor code scheme or SMD resistor coding scheme has started to be used, and it is aimed at 1% tolerance SMD resistors, i.e. those using the EIA96 or E-96 resistor series. As higher tolerance resistors are used, further figures are needed. 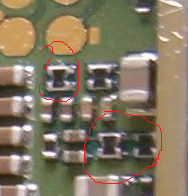 However the small size of SMT resistors makes the figures difficult to read. Accordingly the new system seeks to address this. Using only three figures, the actual characters can be made larger than those of the four figure system that would otherwise be needed. The EIA SMD resistor coding scheme uses a three character code: the first 2 numbers indicate the 3 significant digits of the resistor value. The third character is a letter which indicates the multiplier. In this way this SMD resistor marking scheme will not be confused with the 3 figure markings scheme as the letters will differentiate it, although the letter R can be used in both systems. To generate the system the E-96 resistor series has been taken and each value or significant figure set has been numbered sequentially. As there are only 96 values in the E-96 series, only two figures are needed to number each value, and as a result this is a smart way of reducing the number of characters required.